The power of a word of mouth is incredible and it should never be underestimated. People refer other users’ recommendations way too often to neglect them. That is where the power of influencer content comes into play. Due to the massive reach and engagement, the opinion of a thought leader helps build brand awareness and increase conversion rates for your brand. The outcome however will depend on how well you formulate your influencer marketing. Working with the niche influencers is not only a good way to promote your product, but also to create quality content. Focus on long-term benefits, and you will reach bigger audience and gain more free shares. There are thousands of different influencers that publish their content in different media. 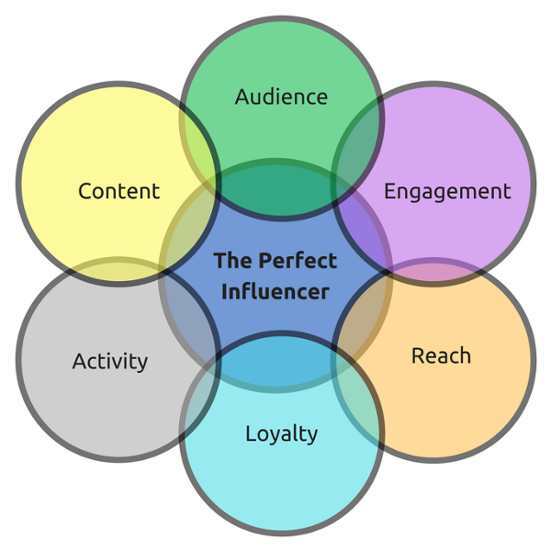 But how to define the perfect influencer for your brand? Scott Paul broke down the following 5 things to consider when looking for a perfect influencer: Audience, Content, Activity, Loyalty, Engagement and Reach. To find industry influencers, I personally use BuzzSumo. 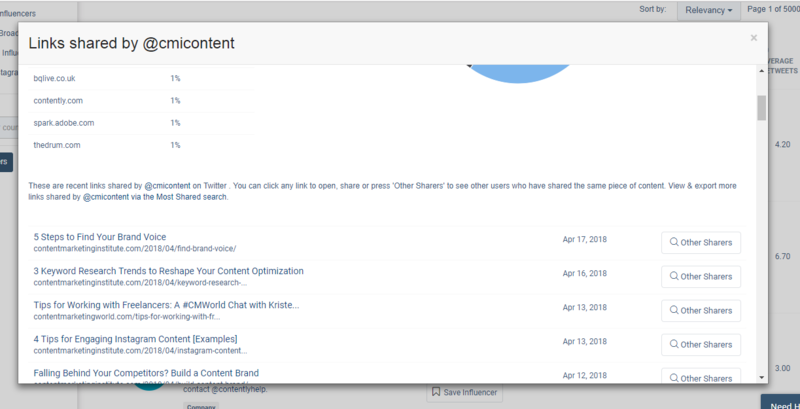 Using this tool you can find key influencers, filter them by location, type of influencer and date. The feature “View Links Shares” gives you a clear idea about what content they publish and how well that content performs. Once you’ve identified your influencers, you should understand how many new and returning readers interact with their publications and how these readers engage with an influencer. Look at influencer’s posting frequency, their content consistency and how their interactions are distributed. To gather this analytic data, I use Socialbakers. The tool provides a clear report that shows your influencer’s performance and helps understand his or her audience better. For Facebook, I truly recommend to use Boosterberg. The tool automatically analyzes available data from the past post performance and takes care of boosting the most successful posts. 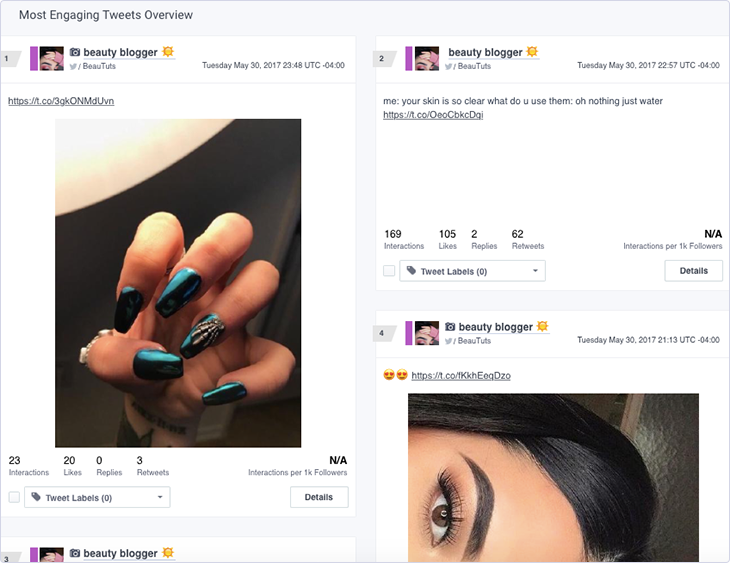 Tribe is a free platform that provides the database of influencers in Facebook, Twitter and Instagram. If you want to track the campaign performance, you need to pay for that. TapInfluence is another marketplace to monitor your influencer marketing. They charge $1,999 per month, which is not so affordable for small businesses though. Now, when you came up with the list of influencers, you should use good keywords to help influencer content get found. Do some keyword research before launching an influencer campaign. The SE Ranking keyword suggestion tool will help you find a set of keywords or keyword phrases that you want influencers to include in their blog posts. Featured tool: The influencer onboarding process takes time and effort. Salesmate is a real catch for companies that want to manage the overall process properly with clear view on each step working with the influencers. The tool is integrated with many apps which allow you to keep everything under the same roof. According to L2 Digital, 91% of luxury brands collaborate with influencers to push their marketing strategies. Many brands prefer to connect with influencers because their content matters and seems to be less promotional comparing to traditional advertising. In fact this approach is called “native advertising” – and for a good reason too! However, be aware of how this native ads are created. Influencers try to make their sponsored content natural, but there’s where you can lose your customers’ credibility. Contently studyrevealed that 48% of potential clients felt fooled once they found out that the content was sponsored. When publishing sponsored content, it is vital to be transparent about your sponsorship. First of all, make a disclaimer that the content has been sponsored, and the views and opinions expressed are the author’s own. Here is how the disclaimer looks like in the following post in Posh Journal. 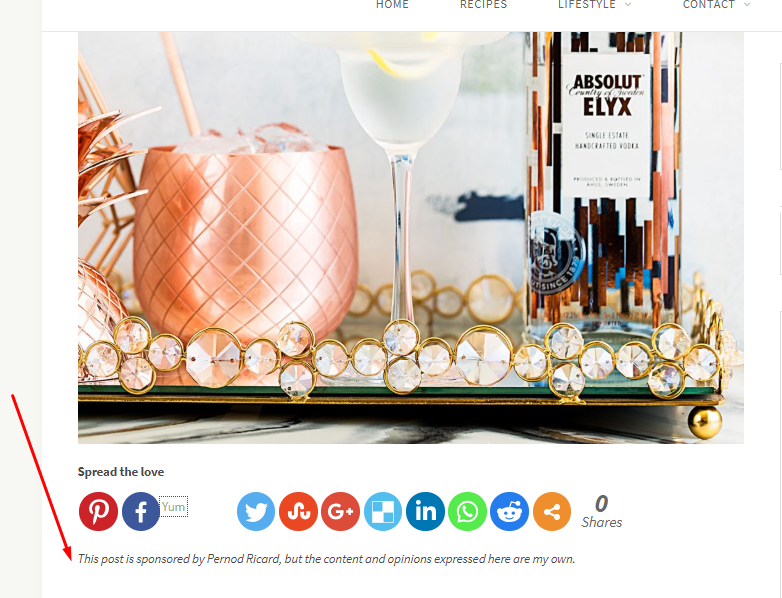 In this post, the blogger talks about different tastes from Absolut Elyx and share his positive option about this this product. Within the sponsored content, it is important to offer a lot of value but be honest with saying that you are illustrating some points using your own product that you are promoting by doing this. This type of openness will increase the trust of your target audience and boost conversions. Collaborating with a powerful influencer can expand the targeting and attract new audience that can differ from your main demographic segmentation. Here is how the beauty brand Estee Lauder, known as a makeup brand for mature women, partnered with Karlie Kloss to attract younger women. We all track the success of our social media activities. Sprout Social reported that 74% of shoppers make purchase decisions while surfing social media. We should focus not only on the audience engagement, but also on taking actions to get more sales and increase revenue. Influencers have loyal followers on social media, and they are a trusted source of information about products and services. Do you want to increase conversions around your products or services? Create a unique hashtag through influencer content that helps increase the brand identity. The goal is to create a community around your hashtag. Influencers can share content with this hashtag or promote it in a blog post, and encourage their fans to use the same hashtag for the sake of being posted in your social media posts, your website, or just participating in a giveaway contest. Use contests to promote the branded hashtag and create more user-generated content around your brand. Once people see how their favorite influencer useы this hashtag, they share their own images with the same one. The idea is that your brand will be always associated with this hashtag. 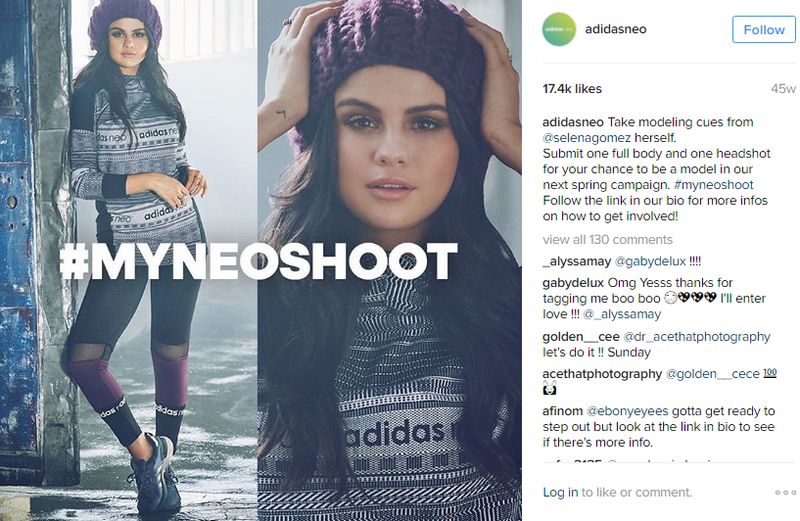 For example, I like how Adidas made its social media marketing campaign on Instagram with Selena Gomez to promote its #MyNeoShoot contest. As a result of this campaign, the hashtag got around 71K mentions and more than 12K entries for the contest. Moreover, because of this campaign Adidas increased the number of new followers to 41K. Giveaway contests are a good way to interact with your audience. Doing it through influencers can help you reach the desirable results for your products. Before choosing a certain influencer, analyze their content and how they have presented other brands in the past. This approach will help you deliver better brand story through the influencer of your choice and stimulate the participation in your giveaway contest to win a free gift. 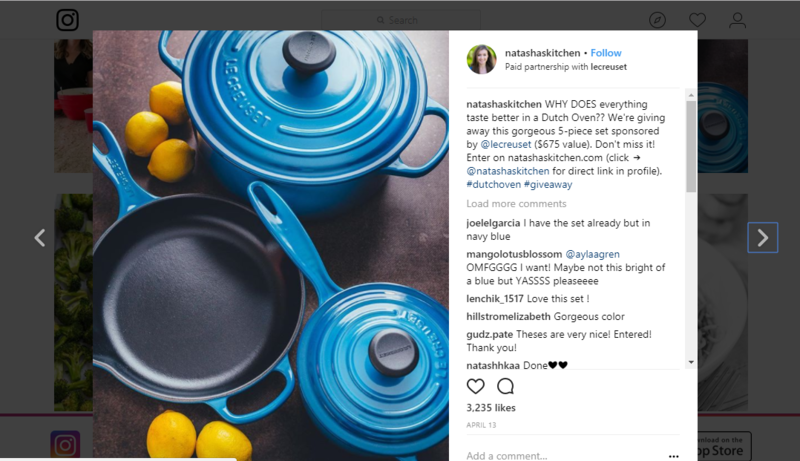 Take a look at the Le Creuset campaign that successfully collaborated with a food influencer Natasha Kravchuk to reach a relevant audience. The prize was the 5-piece Le Creuset Signature Set that is a bit pricey. She created the blog post and social media posts by showing the value of an amazing dutch 5-Piece Signature Set and sharing the best dutch oven recipes people can cook using it. She presented this set as a great investment tool to cook amazing dishes. If you want to increase your brand awareness, promoting your services or products through influencer content are not enough. 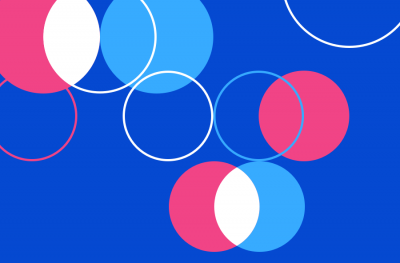 You should help them create an experience around your product. Invite influencers to test your products and share their experiences with their followers. That will build a positive experience with your brand and increase sales. 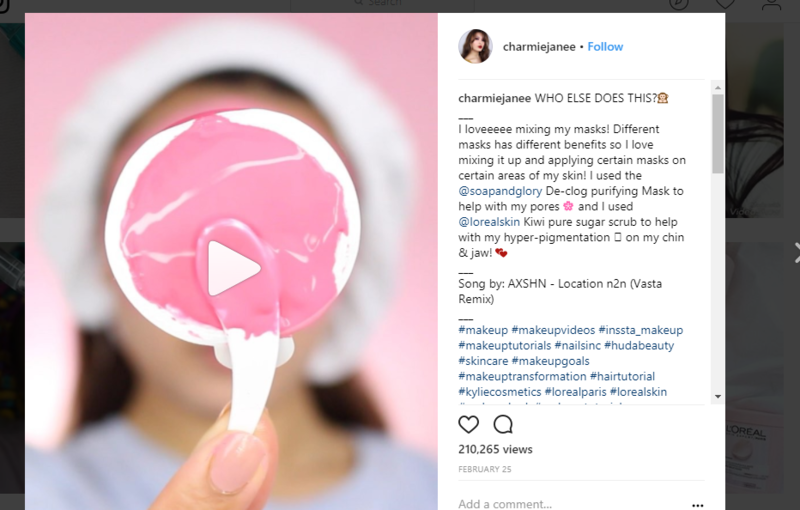 A good example is how L’Oréal partnered with a group of social media influencers to share their experiences using their products with their followers in the form of social media posts, videos, etc. Once you’ve appealed to a relevant audience through engaging influencer content, you can increase conversions and sales encouraging people to act. You can do so by giving influencers unique promo codes, discounts, exclusive offers, and deals so they can share it with their audience. 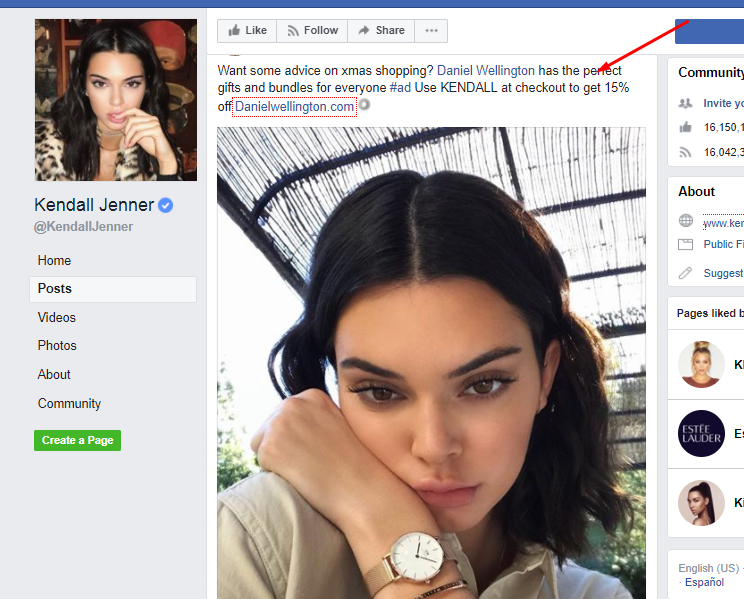 You can make an offer where influencer’s followers can use a discount or a free item to make a purchase. If you want to track the performance of each influencer, you can provide a unique promo code or a custom URL. 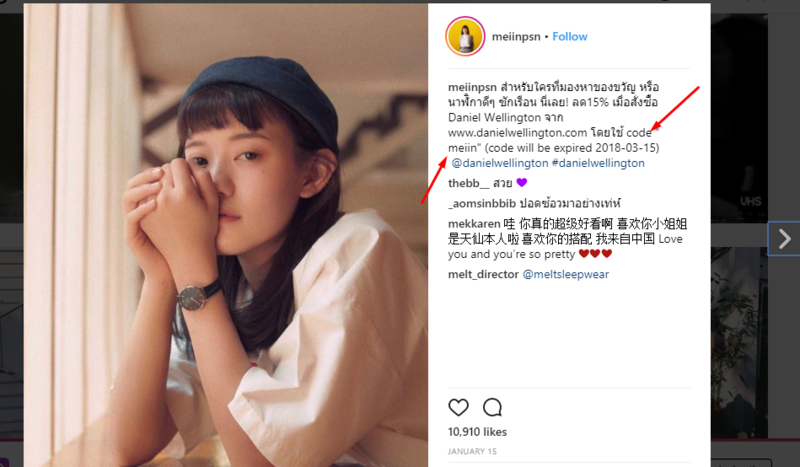 For example, the Swedish watchmaker Daniel Wellington could leverage their brand effectively with the help of influencers in different niches: lifestyle and fashion. Cause marketing is important for consumers and can be effective to increase brand awareness and customer loyalty. 78% of consumers would choose a brand over competitor if the brand is associated with a good cause. And influencers can help promote both – the cause and the brand. For example, IKEA is often associated with furniture, but they actively fight for the right of all kids through the IKEA Foundation and the IKEA Good Cause Campaign. They partnered with influential individuals to promote the #PlayForAll campaign and increased their brand awareness. Video content is one of the most exciting ways to get the word out about your product. Based on the industry research, 52% of online marketers think that video content gives the best ROI. Relevant industry influencers know better how to market a brand or product in their niche. A short interview with influencers is a good way to promote your video to their target audience and generate more traffic to you site. There are different channels to distribute an interview – it can be a YouTube video, a livestream, Facebook, Twitter or another channel. Once you’ve published such kind of interviews with experts in your niche, you will instantly get word of mouth share within their audience who faithfully keeps following and listening to their viewpoints no matter where they go. To increase site conversions, you can create such videos with influencers in your industry. 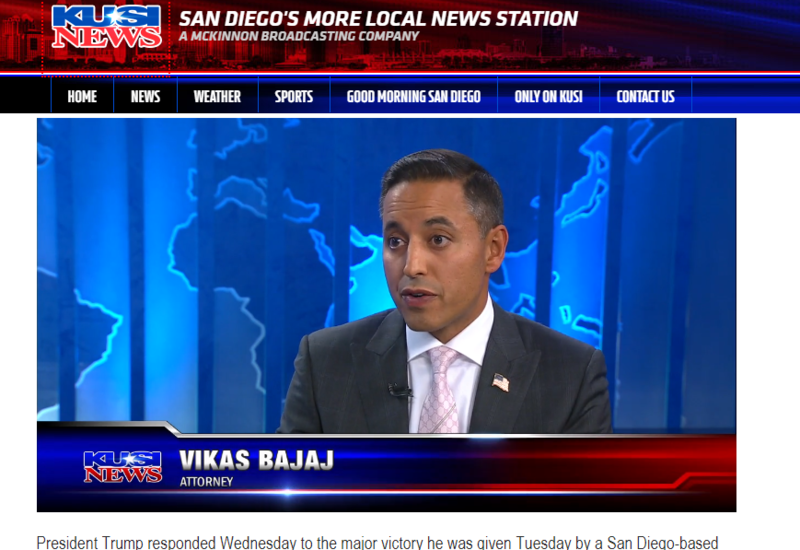 For example, the Kusi News regularly publishes influencer videos on their site. I love how this local San Diego news website invites local influencers and does insightful interviews. Here is how the local famous attorney Vikas Bajaj depicts a local Federal Court decision to allow President Trump’s border plan to move forward. 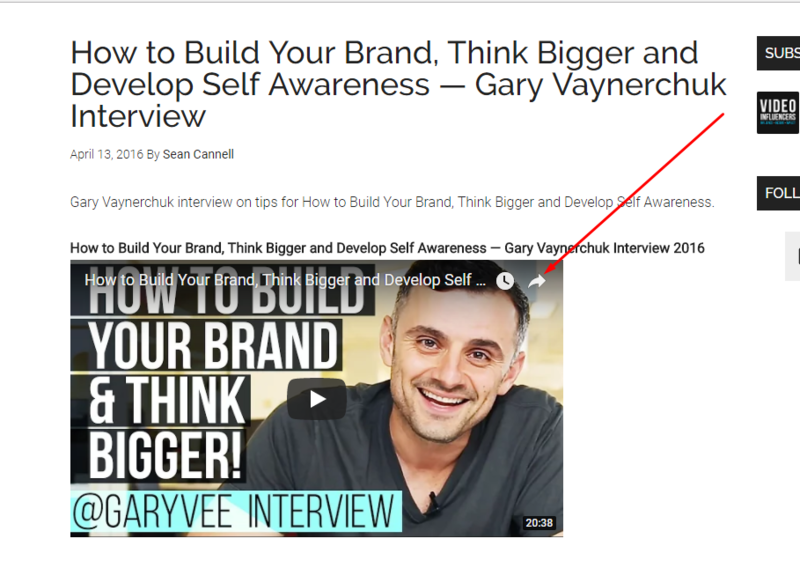 You can look at another example how Sean Cannell from Video Influencers embedded the interview video with Gary Vaynerchuk on his blog and his YouTube channel. He creates such interview videos on a regular basis on the site and on YouTube which keeps his audience informed and engaged. According to Markets Insider, 79% of people are more likely to spend money on a product after watching a video. 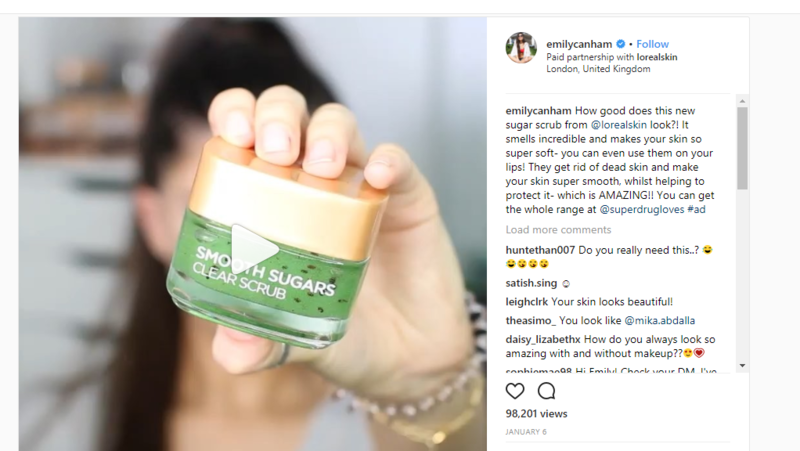 Haul videos feel like more honest and authentic to viewers, because influencers usually demonstrate products recently purchased in its original packaging and condition. This kind of video content is ideal for brands to promote their products and make people spend more. 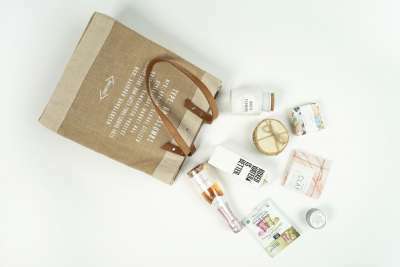 Haul videos can focus on two or three products, or even a variety of products. They work well for brands of all sizes. 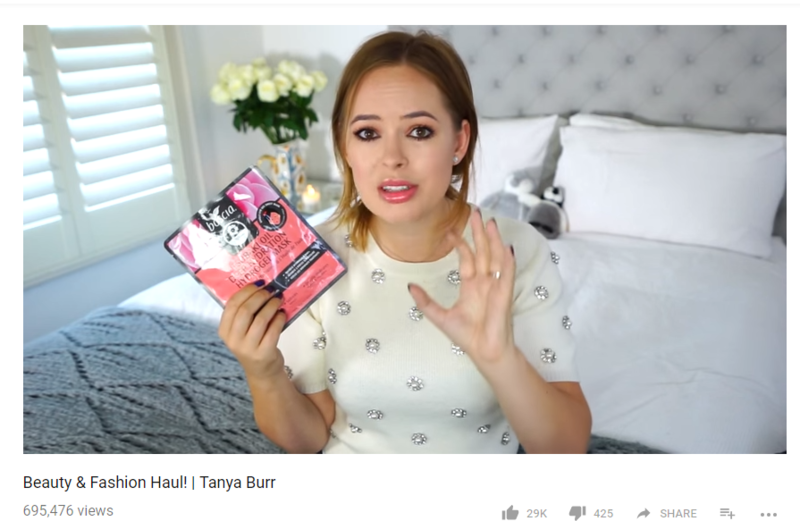 Here is an example how this haul video from a popular video producer, Tanya Burr, got more than 440, 000 videos in 5 days. Video influencer marketing doesn’t mean that you should control each step of your campaign. Influencers consider that being too strict with content guidelines is the biggest mistake that many brands make with influencer marketing. Once you choose a video influencer, it is important to give them creative freedom and trust. First of all, you not only work with them because they are influential but mainly because they are great content creators. According to Crowdtap, 76% of influencers prefer to work with brands that give more creative and editorial freedom rather than competitive compensation. The best way to communicate with your influencer is to convey to them your marketing goals and what message you want to deliver. Then, give them free rein to create a video content in his own voice and style. People love sincerity, and they will instantly notice whether an influencer wants to share or sell something. Your message should resonate with influencer’s viewers. 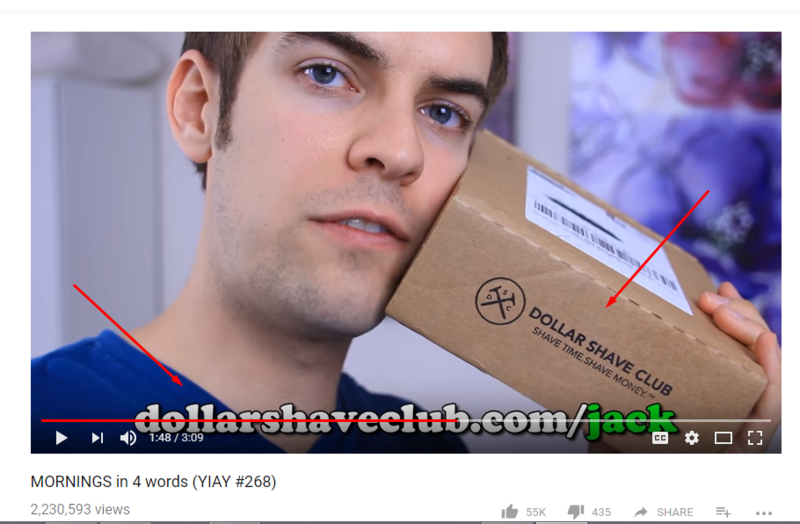 I love how Jack Douglass of Jacksfilms is doing sponsored videos. All his videos are integrated with his regular content. Before promoting Dollar Shave Club, he asked viewers to describe their mornings in four words in the video. He also shared how his own morning look like with the need to shave every day and invited viewers to try this service. Many viewers need to get some recommendations or hear what an influencer thinks about a certain brand or product. Influencers can share their own stories and make a relevant audience try it out. Video reviews for products are a good way to increase trust and loyalty through thought leaders. To improve brand engagement, HP created a wide range of videos with influencers to demonstrate features of its new notebook PCs. The dancer Chachi Gonzales, D.J. “LCAW” and New York City Ballet dancer Sara Mearns use the latest HP notebooks to show their performances, from high performance aluminum keyboard to shooting high-definition video. HP communicated with each influencer and allowed them to share the videos within the video shoots on their social channels like Twitter, Facebook, Instagram, etc. There are a lot of effective ways to market your brand with the help of influencers. All of these strategies can help reach a relevant audience, earn their trust, and encourage them to take the desired action. Which of these ways will you implement first to increase conversions? Tell us in the comments below. Irina Weber is an active blogger, content marketing enthusiast and brand manager at SE Ranking whose contributions regularly appear in publications related to online marketing, social media, conversion optimization, and business development.